This week everything's gone Googly: we've seen a host of announcements from Google on Android M, Android Pay, virtual reality and Google Maps too. There's even a search algorithm that can detect accents and change search results accordingly. 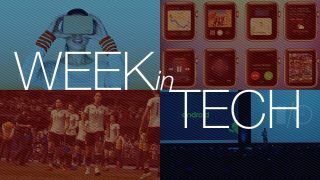 But while Google hogged most of the headlines this week, we also saw some interesting moves at Apple, and tech provided FIFA with its only good press this week. Google IO is the search and software giant's annual event for developers, and it's where Google sets out its stall for the year ahead. This year that stall includes a new version of Android, Android M, which is going to fix all the bugs and power issues that affect existing versions of Google's mobile OS. Apps will no longer demand all the possible permissions when you install them, Android devices will support USB-C for super-speedy charging, and the new Now On Tap feature will bring relevant information up whenever you need it. The developer preview of Android M is out now but it won't make its way to Nexus devices until later this year. The rollout for other firms' kit is likely to be even later. Google IO wasn't all about dull but useful OS updates, though. There were vastly improved Google Maps with proper offline operation, Google Cardboard for iOS, and a new project to make VR videos. And there was money news too. Remember Google Wallet, the easy electronic payment system that didn't really change the world? You can forget about it, because it's dead and Android Pay is taking its place. Android Pay will work at 700,000 stores from day one (in the US), and you'll be able to use your fingerprint to approve purchases. One of the most useful things we saw at Google I/O was the new Google Photos service, which offers free, unlimited photo storage that makes Apple's iCloud pricing look ridiculous. Google Photos was already in Google+, which means only three people knew about it. By spinning it out as a separate product Google hopes to win over people who wanted to upload photos but didn't fancy storing them in a social network. From Google's point of view it gets stacks of photos to train its image recognition bots. It looks like Google doesn't just name its products after confectionery brands: it's moving into kitchen products too. The finest minds on the planet have decided that the best name for their internet of things operating system is, er, Brillo. In the UK, that's a soap-filled steel wool pad that you use to clean pots. We can't wait to see what Google Cif, Google Cillit Bang and Google Mr Muscle turn out to be. It's summertime and that can only mean one thing: it's time to think about Black Friday. The US's annual Thanksgiving shopping frenzy is becoming a big deal in the UK too, and we've discovered what went wrong with so many retailers last year and what gadget goodies you can expect this year. When Apple goes shopping the tech world pays attention, because it often gives a clue to Apple's future direction. So what should we make of its apparent purchase of Metaio, the VW spin-off that specialises in augmented reality and computer vision? When you consider that Apple has also purchased Kinect inventor PrimeSense, it looks like Apple is thinking of a keyboard-free future – something that's also evident in its plans for the Apple Watch, which will include proper third-party apps this year. Is Apple also considering a Jonathan Ive-free future? The design chief has been given a new title, God of All Things. Sorry, we mean Chief Design Officer. That frees him up to "travel more" and to focus less on the day to day management of design things. Pundits are divided: some think the promotion essentially makes him the new Steve Jobs, the ultimate decision maker on everything Apple makes, but others think that the promotion is the beginning of the end of Ive's time at Apple. Expect the Apple Kremlinologists to be watching every beat of the WWDC keynote in just over a week's time. There's been a lot of FIFA news this week, leading to the inevitable 'shopped images of FIFA 16 boxes depicting Sepp Blatter behind bars. But there was a brief bit of FIFA sunshine amid the gloom this week when we discovered that FIFA 16 will include the top twelve women's teams: Australia, Brazil, Canada, China, England, France, Germany, Italy, Mexico, Spain, Sweden, and the USA. We say "brief" bit of sunshine because inevitably, some mouth-breathers turned to the internet to show that they have serious issues with women in their games. We could have stopped that sentence before "in their games". Or before "with". Google's got a new idea: voice searches that return different results according to your accent. There's a serious plan behind the daft-sounding idea: if people with particular accents prefer particular search results, then other people with the same accent might have similar preferences. So for example a search for "dinner" with a French accent might prioritise French restaurants, while the same search by a Glaswegian would presumably return Irn-Bru and deep-fried Mars Bars.